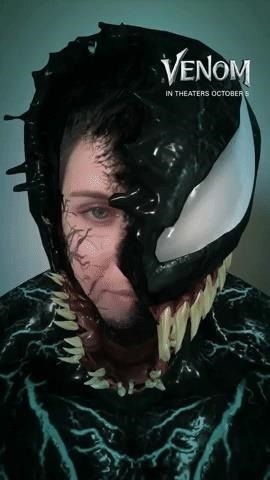 Now, via augmented reality, we, too, can be Venom. 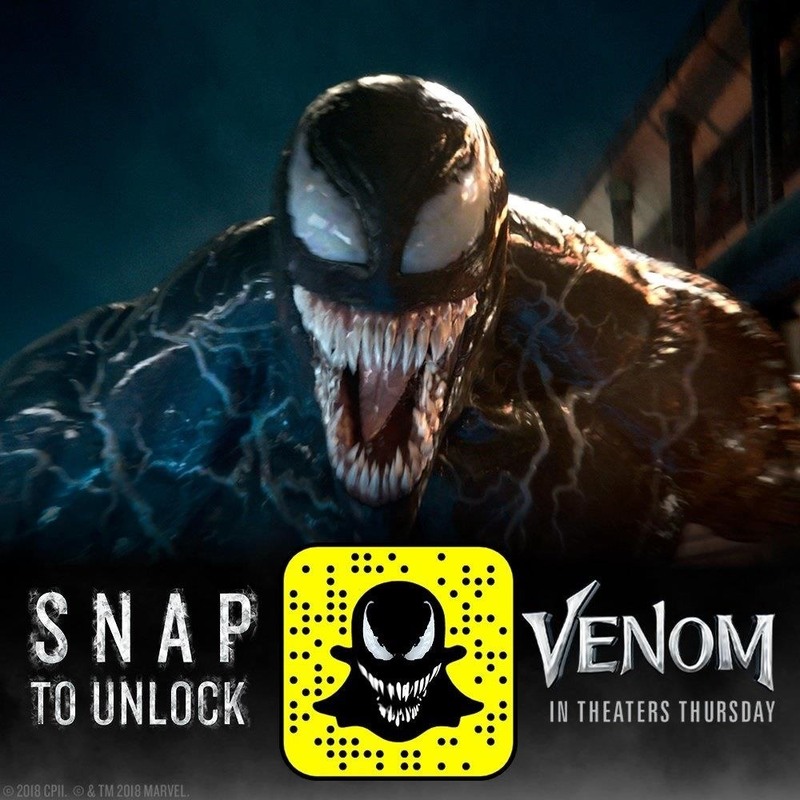 Sony Pictures, in conjunction with the release of the film Venom, has published new AR experiences via Snapchat and Facebook that enable fans to transform into the anti-hero. On Snapchat, the user's face and body are almost completely enveloped by the virtual Venom. With a tap, the user is fully covered by the mask, much like the transformation in the film. When users open their mouths, Venom sticks out its famous tongue. 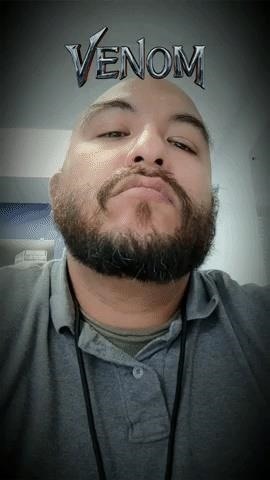 By default, the AR Lens also transforms the user's voice into the beastly growl heard in the film's trailers, but tapping the voice changer icon toggles the audio experience to an Eminem track, with the wholly original title of "Venom," from the motion picture soundtrack. The experience will be available in the Snapchat carousel on Friday, but you can access it today by scanning the Snapcode below or clicking this link on your mobile device. On Facebook, the AR experience is less involved. 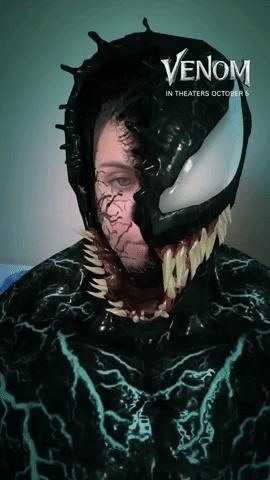 When users nod their heads, they are swallowed by the alien symbiote, which becomes a virtual mask complete with the character's trademark wagging tongue. 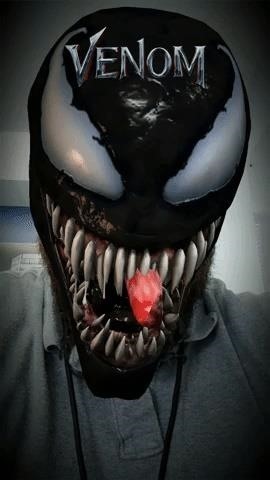 To access this experience, open the Camera in the Facebook app, tap the magic wand icon to pull up the available AR experiences, and scroll to the Venom logo. At this point, it might be easier to name the new release movies from 2018 that haven't been promoted with augmented reality experiences rather than to list all the ones that have. For example, Universal Studios ran AR experiences through Facebook and Moviebill, the AR magazine published by Regal Cinemas, for the latest installment of the Jurassic Park franchise. For the home video release, the studio came back to Facebook for another AR experience. Oh, and the franchise has its own location-based AR game and AR books, too. With nearly three months to go in 2018, we can expect to see many more examples of AR going Hollywood.